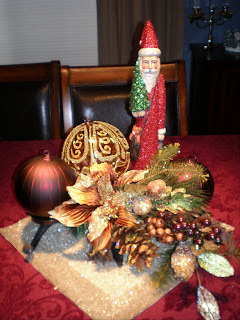 yesterday and I did buy a few new things to make my centerpiece. Oh wow, that turned out beautiful! How elegant! But where did Mr. Squirrel end up? That looks really, pretty. You don't have to have a lot of decorations to have the Crhistmas spirit, and it looks like you have it!